Ma ny of our team members volunteered at the Cedar Falls FLL Regional Qualifier. At this event we demonstrated the 2014 robot Flik. Our demonstration encouraged and educated FLL teams about pursuing robotics options after FLL. We were also asked to demonstrate our robot at the Cedar Valley STEM Festival at the Sullivan Brothers Center. 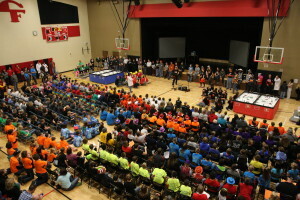 This event gave us the opportunity to show younger students about what it would be like to be on an FRC team. 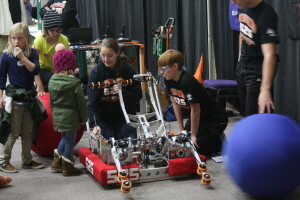 The team held a fundraiser called Bots For Tots to raise money and toys for Toys For Tots. 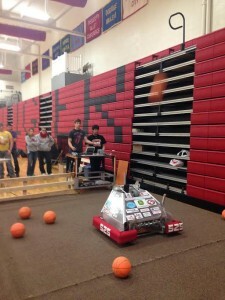 With a donation of $2 or a toy, students and teachers used our 2012 robot, Captain Pike, to score baskets. High scorers won a Swartdogs t-shirt. Current team members shared the advantages of being on a FIRST Robotics Team at the Cedar Falls High School STEM Open House. On January 3, our team served as an official FRC kickoff site, as we hosted two other teams in the unveiling of the game for this year. As an official kickoff site, we were able to display a full game field that was built by a couple of our mentors. After we watched the livestream of the game, we practiced the game using human robot simulation. 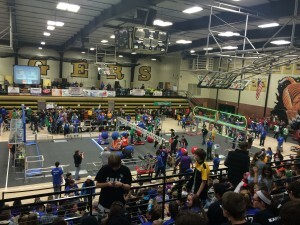 We split into teams of 5, intermingling robotics teams and conducted match simulations. Later in the day we had a lock in with our team and had lots of team bonding experiences while playing card games and watching Wall-e. The Cow Town Throwdown, in Lee’s Summit, Missouri, was an exciting off-season event that we participated in. It was a great opportunity for our new students to experience the excitement of a real event and we were fortunate to win the event.